Raising 4 kids over the last 13 years we have used MANY medical devices. 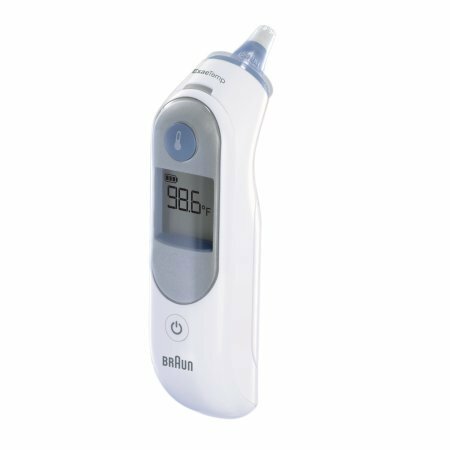 Our first "good" Thermometer was a similar Braun ThermoScan but back then it was like $70! It lasted about 6 years and was great. Our next Thermometer was an Exergen TemporalScanner Infrared Thermometer (also rated 5 Stars) but it only lasted about 3 years then started reading way off temp. So we all got the H1N1 Flu 2 days ago and needed a new Thermometer. Back to the Braun ThermoScan. This newer 1 is even better than the original and since technology has caught up to price it is under $40.00! The only thing that is a "pain" is the probe covers. I wish it had Bluetooth and an App to track readings. I have been getting a lot of the new iHealth Bluetooth integrated products like the Pulse Oximeter so it would be awesome to keep all the data in 1 place. But if you need a quality Thermometer the Braun is awesome and last a long time (quality product). I have used many different thermometers and this one is the only one that seems to work well. It is quick and is accurate. It also take AA batteries which makes it much easier to keep it powered when needed. Works great. The time it takes to read the temperature takes a few seconds longer than my previous Braun. Also, my previous braun used Lithium batteries. this one uses AA Batteries. I purchased one of these from another store after my son spiked a temp around 102º and had a febrile seizure. I needed something more accurate than the Babies R Us brand to monitor him over the next couple days. It's one of the most expensive ones out there and for good reason. Very accurate and even stores past readings. Only problem I had with it was when my son tossed it in his very full laundry basket and I didn't find it until I was moving the load to the dryer. Ack! I went online and purchased it again within the hour. Perfect for fast and accurate temperature determination. It beats using the old-school glass thermometers that need patience and a non-squirming patent. In my opinion, this is the best thermometer on the market..I own one, and recently purchased one for a gift...Very accurate, and ease of use is wonderful...Everyone should own one. As a nurse I never felt comfortable with the cheap thermometer for my family. This thermometer is great, very similar to what we use in the hospital. Simple and accurate every time. Highly recommended over the newer forehead scanners or the old cheapy thermometers. And worth the price! I haven't had it that long but it seems spot on accurate with every one if my family including my toddler. It was a bit pricy but I've gone through how many other kinds that were a little cheaper then this and was so inaccurate it wasn't even funny. So easy to use. Better than trying to move a thermometer over a child's forehead while he is moving. Too bad they say a new filter be used every time because they are too expensive. But I still like it and bought it knowing this.